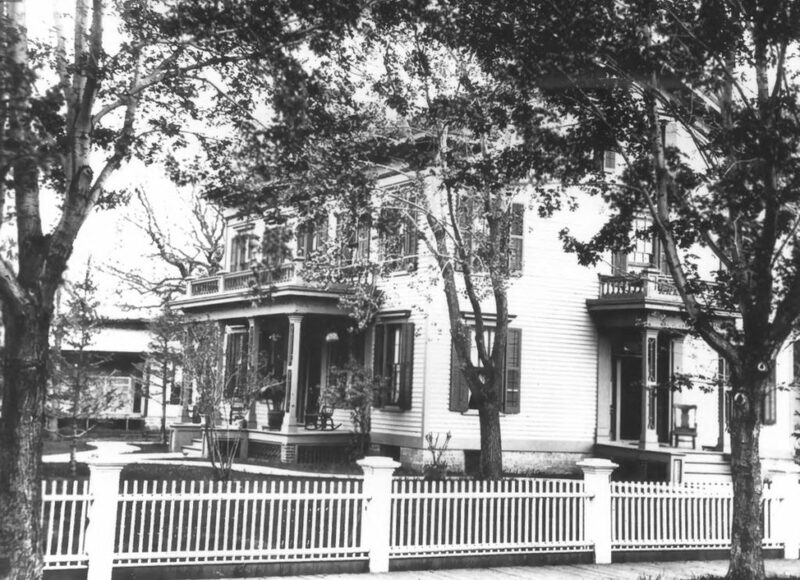 When Major William Watkins Smith came to Sleepy Eye with his wife, Ada, they purchased property on the southwest corner of Linden Street and First Avenue South to build their new home. 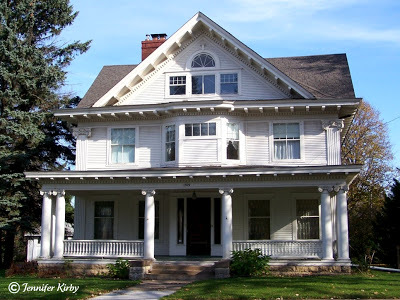 Finished in 1901 and built by the Steinke-Seidl Lumber Company, this two and half story clapboard-sheathed home combines both Queen Anne Victorian and Classical Revival (also known as NeoClassical) architectural elements, and is a masterpiece in design. William was one of Sleepy’ Eye’s earliest bankers. Born in 1857 as the youngest of five children, he was raised on his family’s 600 acre farm in Oakfield,Wisconsin and graduated from Lawrence College in Appleton, Wisconsin in 1881. 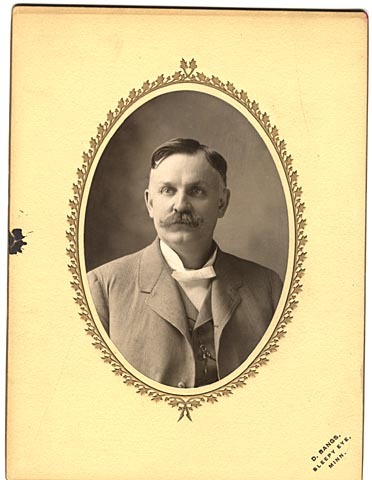 After spending a year working at a bank in South Dakota, he moved to Sleepy Eye in 1882. At that time, the town was only 10 years old when Smith and his partner Clarence D. Griffith opened the Merchants Bank. Over time, the two men earned a great reputation with local farmers and businessmen, and in 1902 converted their bank to the First National Bank of Sleepy Eye. 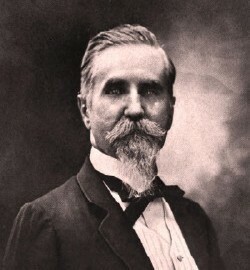 Smith served as the bank’s cashier for over 50 years, never wanting any other title, and was also involved with the Board of Education and the Republican party. No corners were cut or expense spared when the house was built, with artisans, that were crafting local churches at the same time, utilized to obtain stain glass and exotic woods. Two beautiful leaded glass doors open into the expansive foyer with 10 foot high ceilings, gas fireplace, and ornate woodwork. The formal parlor connects to a sitting room with a large bay window and three sets of pocket doors. 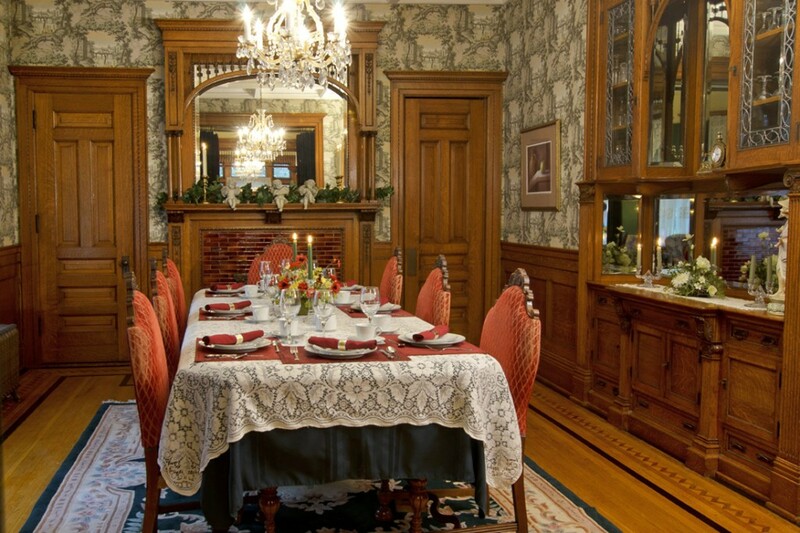 It is easy to imagine how elegant dinner parties must have been in this home’s dining room being surrounded by a fireplace, built-in China cabinet, and crystal chandelier. As an extra architectural detail, each of the formal rooms feature a different inlaid floor pattern. The original library, with built-in book shelves, fireplace, and Steuben light fixture serves today as an office and reading room. 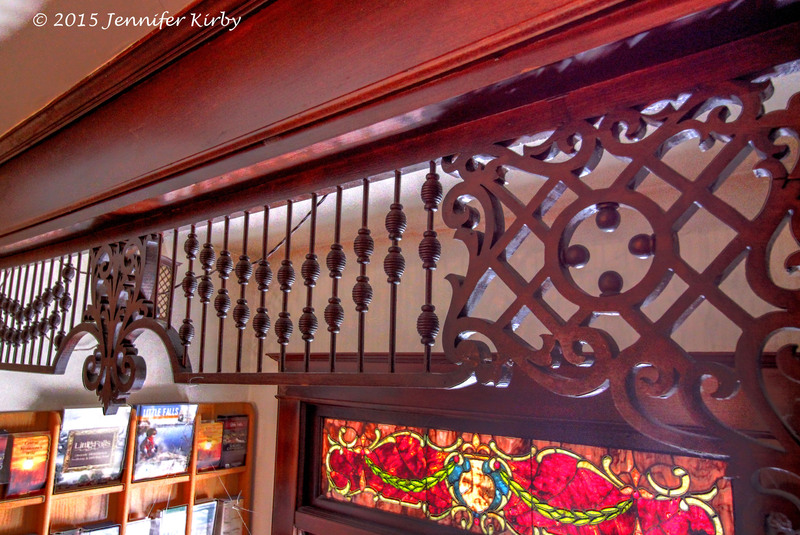 The grand staircase still retains an original Tiffany newel post fixture as well as three beautiful stained glass windows at the first landing. The second floor features a master suite, three guest rooms, and three full baths. Varying wood species are used throughout the home including quarter-sawn red oak and American chestnut. Additional historic elements include working servant’s call box, transom windows, and many original light fixtures. A servant’s staircase leads to the finished third floor, currently serving as the owner’s suite with living room, office, bedroom, walk-in closet, and bath. 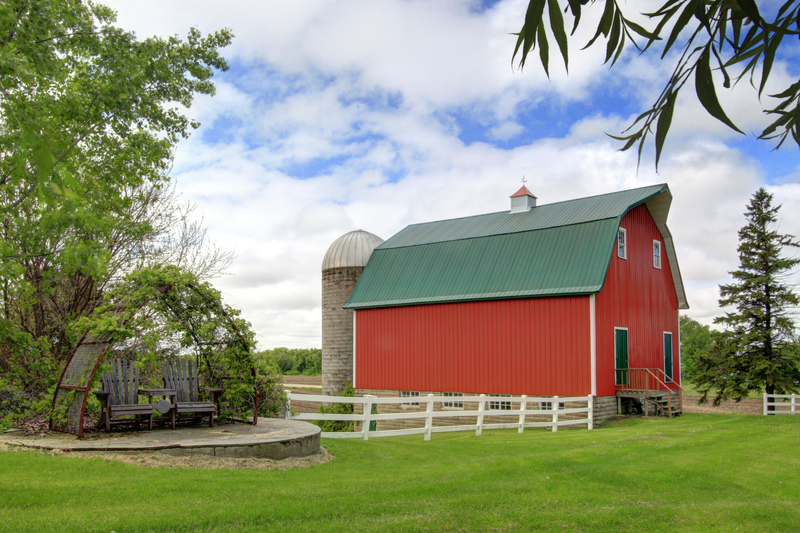 The Carriage House was used to store the Smith carriages and the horses. Horses were boarded in what is now the Box Stall bedroom on the first floor. It is reported that Smith owned the first automobile in Sleepy Eye and shortly after, the Carriage House was converted to a garage. In the late 1990’s the Carriage House was converted to guest rooms, now featuring a bedroom and living room/dining room space on the first floor, and a spacious bedroom suite with 2-person whirlpool tub on the second floor. 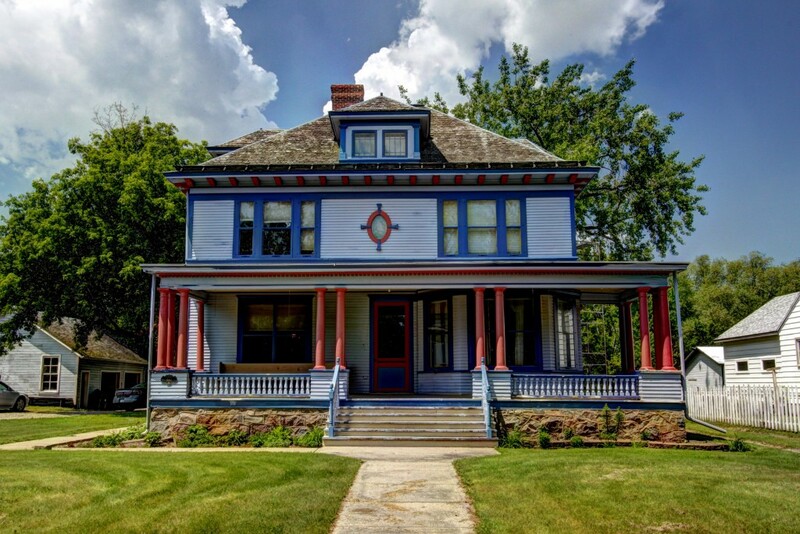 Now listed on the National Register of Historic Places, the home is much the same as when it was first built, with a few exceptions, and an amazing restoration. 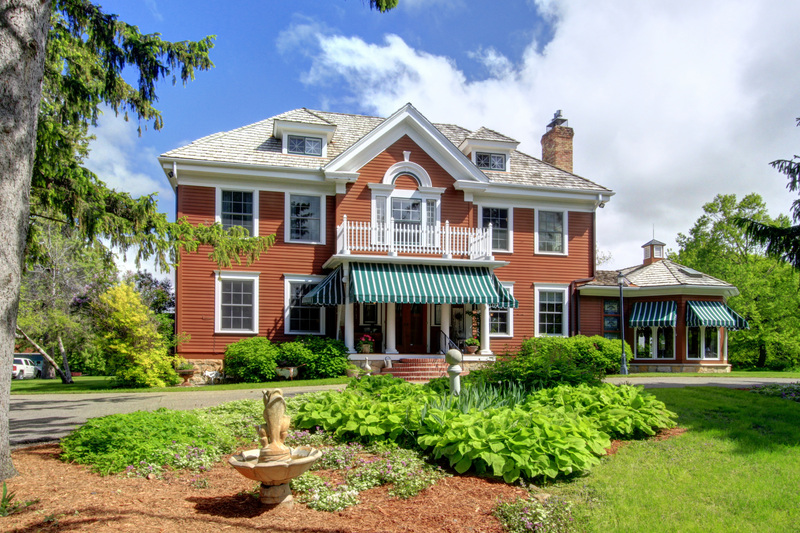 Currently operating as the W.W. Smith Inn the home is For Sale with additional information at the property website. Located in the small town of Barnesville on the western fringe of Minnesota, and just 30 miles from Fargo, lies a beautiful historic home on almost 5 acres of land. 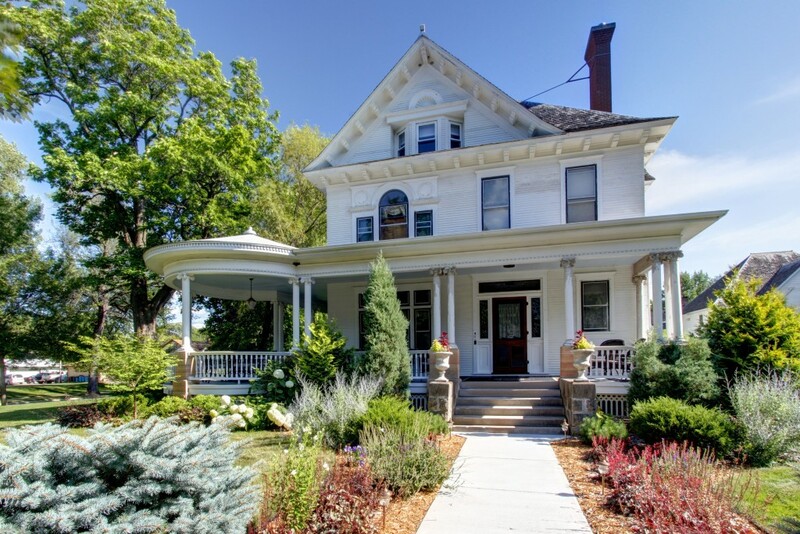 Built in 1903 for Peter and Hannah Thompson, the home was designed by the Hancock Brothers, one of North Dakota’s most prominent architectural firms. 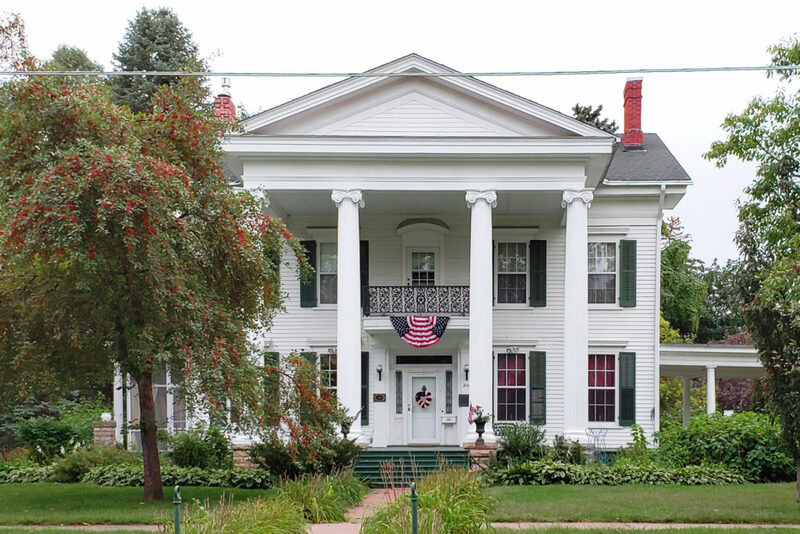 It is historically significant as the only surviving property in Barnesville associated with the Thompson family, commonly known as the “founders” of Barnesville, and is locally a rare example of the Classical Revival style (also known as Neoclassical), not to mention one of the last remaining homes designed by the Hancock Brothers in Minnesota. Remnants of the original carriage house foundation can still be found behind the home. Peter E. Thompson was a mercantile store clerk for George Barnes in 1878, a businessman who opened the first grain collection center years before 7 miles outside of present day Barnesville. By 1880, Thompson owned the store and it quickly became the core of the settlement of Barnesville. As Barnesville grew, Peter Thompson emerged as a prominent leader. He served as the first postmaster from 1878 to 1885 and was elected the first justice in 1881. In 1889 he became the first Mayor and in 1891, Thompson was elected to the Minnesota legislature and served two terms. Needless to say, he made a lot of “firsts” for Barnesville. Sadly, two years after moving into their new home, Peter died at the age of 52. Hannah lived at the home until her death in 1920. They had seven children and were known to be very generous, often taking employees or ministers and their families into their home. They also donated real estate for the first school, a local park, and two churches. Two of the Thompson boys owned the home following Hannah’s death, the last living there until 1975. The current owners have been renovating the home and property for several years. 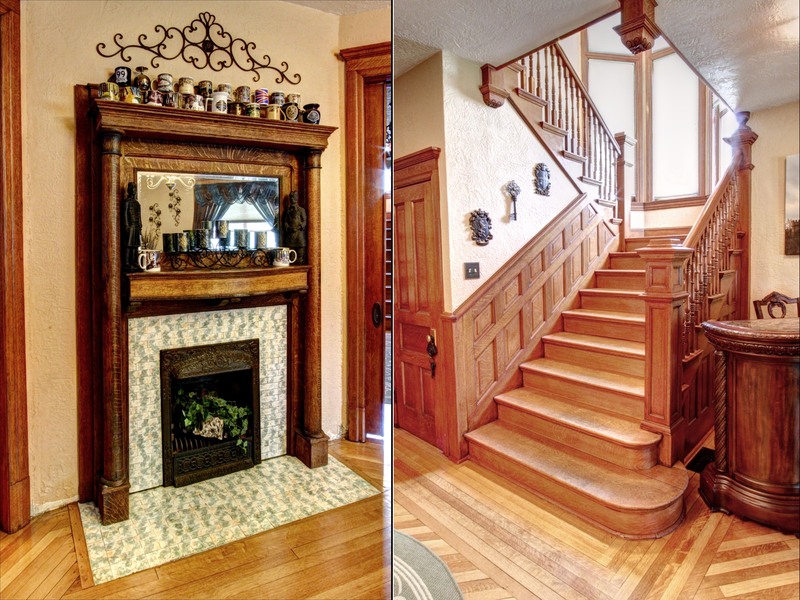 Most of the first floor woodwork has been restored, a painstaking process of stripping, sanding, and re-staining the floors, decorative trim, doors, and elaborate staircase. The original dumbwaiter is still present, and there is a small ladder in the attic leading to the widow’s walk. For the kid in all of us, the third story bedrooms feature small doors and windows leading to “secret passages” between each room. The home is currently For Sale with additional information located at the property website. 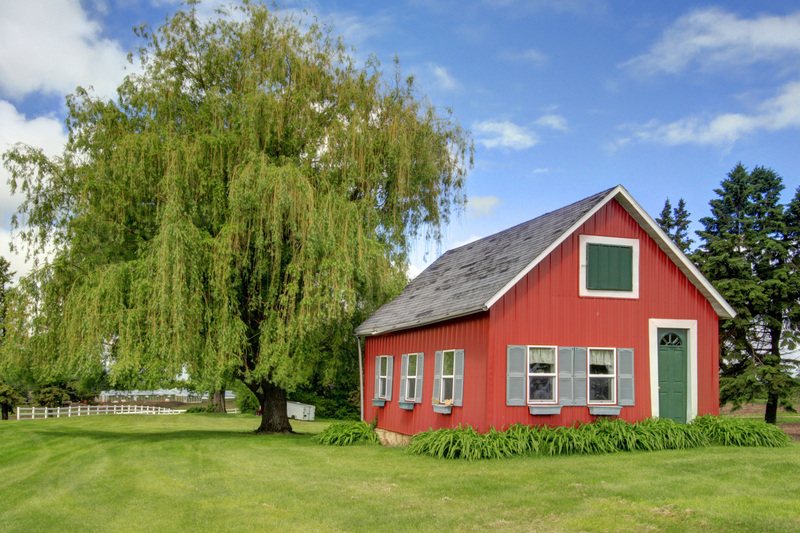 In 1996, the home was added to the National Registry of Historic Places. The photos below are from the 1993 application and show how the home looked when it still had the second floor balustrade and roof widow’s walk balustrade. 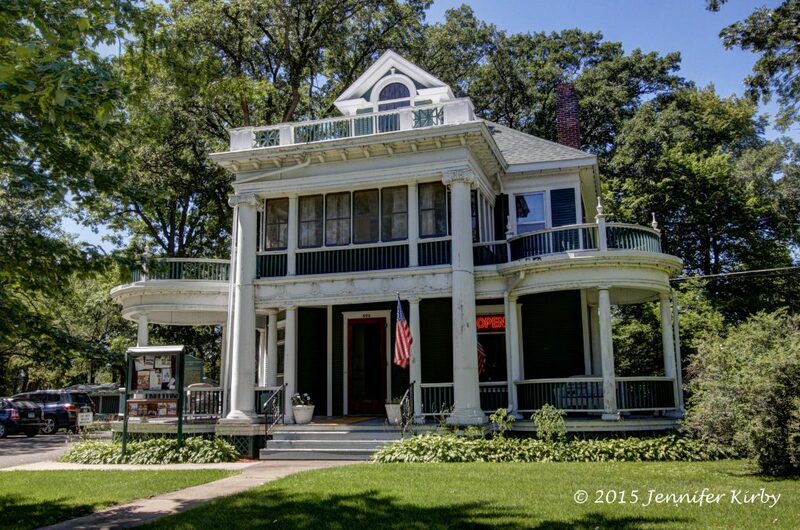 Designed by Saint Paul architect Louis Lockwood, the home was constructed by Frank Linner for James and Susan Johnson in 1905. Neoclassical in design, the home has wonderful Corinthian porch columns, as well as Corinthian corner columns. Also standout features are the windows, with multi-pane upper sash and single pane lower sashes, including the Palladian window on the third story.